Make sure that the zero point calibration has finished normally, and then perform sensitivity check. No objects are placed on the front passenger seat. The front passenger seat belt buckle switch is off. 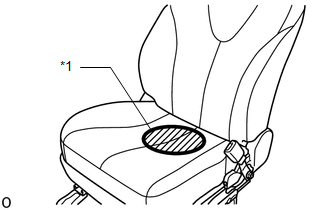 (2) Adjust the seat position according to the table below. (6) Enter the following menus: Body Electrical / Occupant Detection / Utility / Zero Point Calibration. (7) Perform zero point calibration by following the prompts on the Techstream screen. (3) Turn the ignition switch to ON and turn the Techstream on. (4) Enter the following menus: Body Electrical / Occupant Detection / Utility / Sensitivity Check. (5) Perform sensitivity check by following the prompts on the Techstream screen. (6) Confirm that the initial sensor reading is within the specified range. (7) Place a 30 kg (66.1 lb) weight (eg. a 30 kg (66.1 lb) of lead mass) onto the front passenger seat. Do not allow the weight to come into contact with the seatback when placing it on the seat cushion. Place the weight in the area shown in the illustration. (8) Confirm that sensitivity is within the specified range. When performing sensitivity check, use a solid metal weight (the check result may not appear properly if a liquid weight made from liquid is used). If sensitivity deviates from the specified range, retighten the bolts of the front passenger seat without deforming the seat rail. After performing this procedure, if sensitivity is not within the specified range, replace the front seat frame with adjuster assembly RH.